Gaining more poise with each day she trains at Meydan, champion Royal Delta was able to share some of her self-assurance with another American runner in Dubai on March 26, guiding UAE Derby (UAE-gr. II) contender Lucky Chappy around the track during morning training. The two could not have been much more of an odd couple—the regal 16.2-hand filly with the immature and smallish colt a shadow in her wake. Caption: Royal Delta and Lucky Chappy in Dubai. 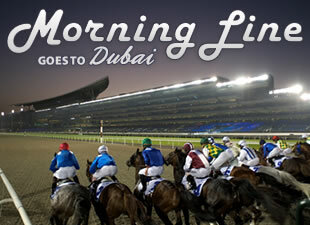 Yet each galloped happily, traveling about 1 ¼ miles over the all-weather track with Dubai World Cup (UAE-gr. I) challenger Royal Delta showing the way with long effortless strides and Lucky Chappy bounding along behind her, dropping back a few lengths as they traveled further. Both riders—Leana Willaford, assistant to Royal Delta’s trainer Bill Mott, and Alice Clapham, assistant to Lucky Chappy’s trainer Graham Motion—were laughing and joking as the work came to an end. Royal Delta and Lucky Chappy have forged something of an equine friendship during the week they have spent so far in the United Arab Emirates while housed in Dubai World Cup Quarantine Barn 3, the riders said, and get along well. Willaford and Clapham also are friends, and they might decide to reprise the duet with the colt and filly in coming days. Lucky Chappy, who began his career in Europe and was a stakes winner last summer in Italy, is accustomed to the European training style in which horses stabled together tend to go out in groups to exercise. “She doesn’t mind,” Willaford added of Royal Delta’s approach to having a shadow. 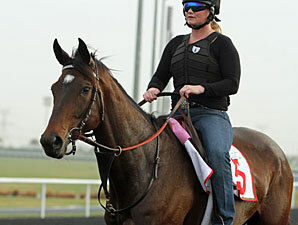 Each day, Royal Delta has shown she feels more at home at Meydan. She was so relaxed after ending her gallop that Willaford did not object to standing her in a pose for Dubai Racing Club photographer Andrew Watkins as the filly and Lucky Chappy paused briefly while heading down a chute prior to returning to their barn. Lucky Chappy initially had stood closer to Watkins, but the riders obliged his request that they realign their mounts so that Royal Delta could be the focal point of his shots. “You’re not important enough yet,” Clapham said while patting Lucky Chappy. Royal Delta, on the other hand, already has made a huge mark in racing, as both a champion and an $8.5-million purchase at Keeneland last November by Benjamin Leon’s Besilu Stables. If she wins the $10 million Dubai World Cup on March 31, she will have accomplished something that no other filly or mare has done in the first 17 runnings of the world’s richest race. But on that day, she will not have time to help her friend. Lucky Chappy will be on his own as he tries to make a little history himself by becoming the first American-based horse to win the UAE Derby.